A holiday weekend seems like the perfect time for an old standby Ten On Tuesday topic: 10 Things I Did This Weekend. Let’s go! Finished a pair of socks. More on that tomorrow. Knit and knit and knit on Germinate. The rows are looooooong now but I’m getting there. Made pumpkin donuts. Mmmm hmmmm. Watched the Pats win against the Saints with only 5 seconds left on the clock. There was jumping up and down and yelling. Nested. Fall decorations inside and out, candles, quilts – you get the idea. Ran. Walked. 8 miles total, I think. Made this delicious chicken dish. It was so good I’m making it again tomorrow night for company. Enjoyed lots of quiet time at home while Dale was out singing with the band. I get lonely when he’s out at night but when it’s in the afternoon – well – I kind of love it. Turned on the heat. Yes, I caved on Monday morning. It was 32° when I got up. Don’t judge me. Read lots of Voyager. I’m still hooked on Jamie and Claire. How was your weekend? Click the link below to add your post. Click here to sign up for the Ten On Tuesday email list. 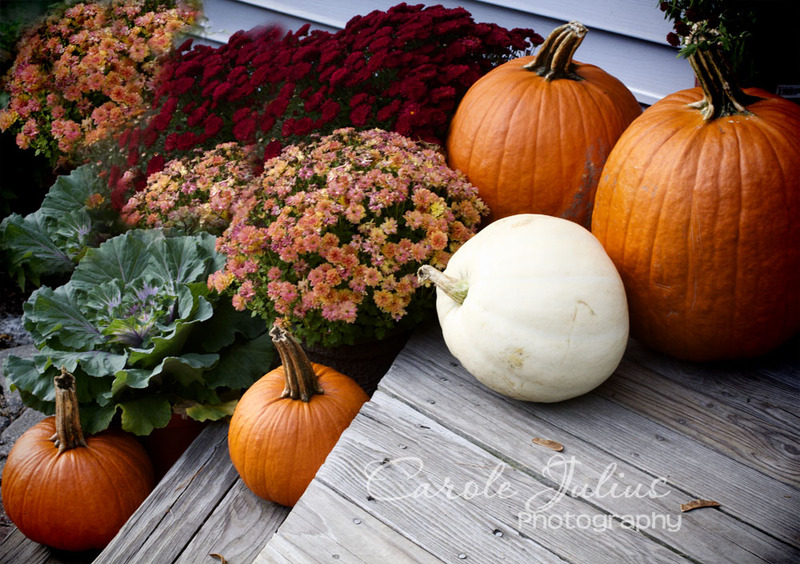 Love the pumpkins and the mums together…pretty! Our heats been on for a month. It’s been that kind of year. Your weekend sounds relaxed and full of fun, too! simple and quick! My kind of a recipe. Glad you enjoyed your weekend. We do not celebrate Columbus Day here in NC and I miss the that three day weekend. awesome – must try that one! Thanks for sharing it. I’ve been turning on the heat for a cycle here, a cycle there, just to take off the chill. Soon, though, I think it’ll be turned on for good… in fact, I know it’ll be turned on for good! That chicken dish looks delicious. We’ve had a couple of heat cycles here too. And I meant to write to you yesterday and ask if your heart had stopped pounding yet! Beautiful shot up there! Oof, 32 is too cold! No judgement here! I’ve been tempted a few times to turn on the heat, but we haven’t been THAT cold yet!! Today’s autumn photo is one of your best! I am impressed with your running and walking mileage! If it’s any consolation, we have joined you in the turning on the heat! No heat for us yet … although I did have a fire going in the woodstove up at the lake house! I am working on another hitchhiker … but I’m liking the look of germinate, might have to add that one to my queue! My girl’s home this week and we went out forcoffee on Saturday. So nice to catch-up in person (and to hear about the new boyfriend!!). We went out with friends to celebrate my buddy’s birthday and I worked on some slippers for my guy. It was good, but there were no pumpkin donuts involved. I will be finding a doughnut pan asap! I’m courageously holding off on turning on the heat – but yesterday my hands were so chilly it was hard to knit. Fortunately (for me) my husband precedes me to bed and warms it up nicely. I have to stay up, of course, to see the Pats and then the Sox pull off their last-minute excitements. We haven’t needed the heat yet. So far it hasn’t gone below 45 by us. I know the party will be over soon though! I downloaded Outlander to my iPhone so I can start that again. I plan to listen to it while I’m spinning. Oy. 32. I’d turn the heat on too so no judgement here! LOVE your porch photo. (and I went and searched on Germinate (the link isn’t working on my computer) and saw your colors! OH YUMMY! I’d turn the heat on if it was 32 degrees also. So far in the city, we’re not there yet and putting on layers in the house. Thanks for that chicken recipe! It’s pretty warm here in NYC. Saturday we went to the Kings County Fiber Festival and I caved and got some beautiful green hand-dyed semi-solid sock yarn to make my husband some fingerless gloves. I’m considering actually designing the pattern, something I’m not in the habit of doing. Sunday we went mushroom foraging in Central park and cadged some hen of the woods and a single oyster mushroom. It’s chowder time! Knitting, quiet time, yummy eats can’t ask for anything better on an Autumn Weekend. Great topic! Call me a wimpy Californian…There is NO WAY I could manage a morning at 32 degrees, let alone 50. That was some game! I only saw the last half, but as things were looking like that Saints were going to win, I said to the cat, “Well, if anyone can pull this out for the Patriots, it’s Tom Brady.” After which he pulled it out for the Patriots! I just bought my first Outlander book. I’ll have to move it up my list.